Everyone loves a pair of Dr Martens, and they seem to be all over the show at the moment. Today I entered the competition over on Saraluxe’s blog to win £500 (Yes! FIVE HUNDRED POUNDS) of Dr Martens clobber. This is made even more exciting after their recent collaboration with Agyness Deyn. There is some serious bag eye candy going on over there that I would just love to get my grubby little mitts on. Below is the outfit I submitted as my entry. 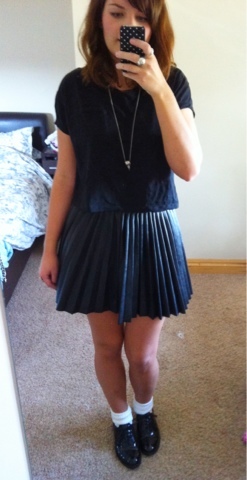 You had to style an outfit including an item from the Dr Martens collection. I chose my black brogues. I hope you like it, and fingers crossed the judges will so I can expand my DM collection! … Ive already mentally spent the £500 three times over…. Love this outfit, so simple but so cute 🙂 I like your blog…I wish you had a google friend connect follow option!